The 2017 Chrysler 300 is a beauty to look at. The massive body gives a hint of the power that this car has to offer. This large-sized sedan is a car that has diminished the boundaries between the mass market and the luxury segment. This bold car is huge and has a big front grille that makes it look even classier. When you step inside its cabin, you will witness luxury all around. However, it is its features and equipment that makes it standout. You will find a decent number of updates in the 2017 Chrysler 300 including the infotainment system. There is a lot more entertainment added to the cabin than in the previous models. The 2017 Chrysler 300 starts from $37,015 MSRP. The 2017 Chrysler 300 has a very American vibe to it. Its big bold body is an American sedan staple with improvised curves and detailing. This car is both slightly sporty and heavily elegant, making it the ideal choice for families in search of a premium sedan. When it comes to its performance, this sedan is no short of wonders. Engine – The 2017 Chrysler 300 is equipped with the 3.6 liter V6 engine that is strong and powerful. Offering 292 horsepower, the V6 engine is quite smooth, offering tremendous performance. And if you choose the 300S model, you will get greater performance with 300 horsepower due to its cold air intake. However, when it comes to its engine, you have the option to select between the 3.6 liter V6 or the 5.7 liter V8. The V8 engine offers a massive 363 hp and is available in the 300S and 300C models. Transmission– The 5.7 liter V8 engine offers the 8-speed transmission that gives off great performance. With the 8-speed transmission, you can quickly change speeds within a matter of seconds. The rear-wheel drive option is standard in both the version, but the all wheel drive feature is only available for the V6. The car offer maximum comfort and drive convenience. And even though the size of this sedan is huge, its electric power steering is quite smooth and can take steep turns with ease. Efficiency– The 2017 Chrysler 300 comes in two types of engines including the V6 with the standard 8-speed automatic transmission and the V8. However, the V6 is much more fuel efficient than the V8. The 2017 Chrysler with the V6 engine has earned EPA ratings of 19 mpg city and 30 mpg highway, resulting in 23 mpg combined EPA ratings for fuel economy. But if you choose to add all wheel drive, your fuel economy takes a hit and drops to 18 mpg city and 27 mpg highway, resulting in an overall rating of 21 mpg. If you opt for the V8 engine, the fuel economy will suffer further reaching up to 16 mpg city and 25 mpg highway, making up 21 mpg overall rating, which is far less fuel efficient. The luxurious sedan is as impressive on the inside as it is on the outside. Its large distinct body is what makes it look incredible. 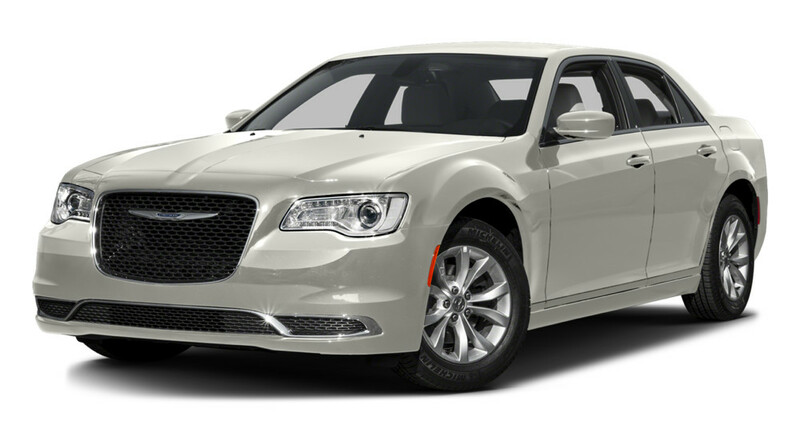 What makes it standout is its trapezoidal grille having a mesh pattern with the Chrysler logo placed at the top. The car has LED taillights and LED fog lamps at the front that make it look even better. The car is a bit square shaped, giving it the distinct look that all 300 models are known for. However, the look of the car depends upon the model that you are choosing. Every model has a different look with the 300S model featuring a black grille with a black chrome surround which give it a ghostly look. The headlights for this model are black with 20 inch black wheels. The platinum versions on the other end have platinum trims throughout the exterior. What makes the 2017 Chrysler 300 one of the most loved luxury sedans is its impressive interior. By looking at the size of the vehicle, you are sure to find a lot of cabin space. What’s more interesting is that the cabin is fitted with the most luxurious leather trims. The leather inside the cabin is polished in two-tones, adding a touch of class. The seats inside the cabin are huge and highly supportive. The front seats have more adjustable options for superior comfort. The overall interior is high tech and fitted with some impressive technologies. The 2017 Chrysler 300 is a posh sedan that is both functional and beautiful. This car is a true American sedan that pampers both the driver and the passengers, leaving them feeling great. Although the fuel economy is not as impressive, this car is a great performer with the right features on offer. If you are interested in test driving this car, head to Derrick Dodge Dealership in Edmonton, AB! Be sure to stop by Derrick Dodge Chrysler, Jeep, Ram to step behind the wheel of a 2016 Chrysler 300 near Edmonton and St. Albert today. Contact us online or by phone at (780) 435-3611 to learn more about the 2016 Chrysler 300, or visit our showroom at 6211 104th Street in Edmonton, AB, just a short drive from St. Albert.